I am bring back Game Watch posts to help those BC fans looking for other fans. If your local BC Club is hosting an event email or tweet the information and I will post it the day before the game. If I miss you info, post it in the comments section. As I have written before, watching a game with other fans can be worthwhile. Only they understand what you are going through. The BC Alumni Association is offering bus transportation to and from Chicago for the NIU game on Friday Sept. 1st. Round trip fare is $30 per person. All bus riders are to arrive at Tobacco Road Tap Room (2249 N. Lincoln Ave., Chicago) at 2:30 p.m., and the bus will leave promptly at 3:00 p.m. The bus will drop riders off at the location of the BC Tailgate in DeKalb, Fatty's Pub & Grill. Following the game, all bus riders will immediately board the bus at Fatty's Pub and will return to Tobacco Road Tap Room in Chicago. As I stated already this week, I hate the idea that Addazio is not naming his starting QB. Why does the guy do this to himself? He's not hurting Northern Illinois. He's hurting himself. The only film on Brown is BC's own Spring Game. The only film on Wade is from two seasons ago against crappy opponents and under a different offensive scheme. What does Addazio think NIU will change in response to either QB? Instead Addazio is wasting his own time, focus and energy on being coy and secretive. I hate to break it to you, Coach, but you are focusing on the wrong thing. BC wins this game regardless of the starter. And if they don't, it will be in part because the staff did not have them ready to play. In a recent interview about his new job, Martin Jarmond said he didn't talk to Urban Meyer about Addazio. His explanation was that he wanted to form his own opinion. I don't think that is how I would approach things. If a friend and colleague has a close relationship with your soon-to-be most important employee, who is responsible for your highest-profile unit, wouldn't you pick the brain of that trusted colleague? Or even get a general opinion? Jarmond will have to make a big decision about Addazio some day. Why not get all the quality information you can? I obviously don't talk to Addazio, but from second hand sources, he clearly reached out to his Ohio State network to check up on Jarmond. He wanted to know what kind of leader he was getting. I wish Jarmond had done the same. 1. Control the line of scrimmage. Even with our potential offensive line rotation, BC has a huge size and talent advantage in the battle between our OL and their DL. We need to pound them and open up holes for the running backs. 2. Get Jeff Smith at least six touches. Smith has the speed and elusiveness to be special. We've shown the willingness to give him special plays in the past. Let's make it a priority this game. He should have a few end arounds and maybe a chance to make a pass. 3. Good clock management. We will see how committed Addazio is to his new 'tempo' offense. My concern is that despite playing at a quicker pace, Addazio will still make questionable decisions in the two minute drill. The last time BC played on CBS Sports Network was in 2012 against Army. Before that, it was UCF in 2011. That was the game where Spaz allegedly got in a fight with Rogers. So lots of good memories for BC fans! Alabama vs Florida State is important for conference supremacy, but also a good glimpse into FSU. If they beat Bama, you know we will have more than we can handle when they come up to Alumni. A dominant performance signally that we are a different program and Addazio is ready to fulfill his promise of a five-year rebuild. Whoever starts (Wade) throws some early, ugly INTs. That will shake the team's confidence and give NIU hope. I expect a low scoring, somewhat sloppy season opener. I think BC plays conservatively and is strong enough on D to overcome some questionable plays and decisions on Offense. Below is my Preseason Periscope. The first of 2017. Thanks for all those who joined in. It is all a work in progress, so I appreciate any feedback and support. Also, let me know what time works for people to join. I tried a noon ET once last year and had a small audience. 10 pm ET seems a bit late. Can and would people watch mid-afternoon like 2:30 ET? -- Addazio not naming a starting QB publicly is silly at best and a sign of panic at worst. No one has any significant film of Wade or Brown. Naming one doesn't offer up an advantage to NIU. I know Harbaugh is doing it too, but all these guys are out thinking themselves. -- The shuffled OL also gives me concern for the similar reasons. When has a rotation worked well? -- I think our Running Backs will carry the team. -- I think we go to a low-level bowl. -- Using more zone coverage will prevent blowouts, but also might lead to fewer sacks. Once again, I appreciate the support and hope BC has a fun season. This is Addazio's team now. All the players are his recruits. He's created a staff of loyal colleagues. He has an AD ready to support him and he has a great recruiting tool in the new Indoor Practice Facility. Whatever he accomplishes this year is probably as good as it is going to ever get at for him at BC. I am not predicting a breakthrough. I think it will be just more of the same. This will serve as my official prediction for the season. at Northern Illinois. Win. The team doesn't look great, but Addazio is lucky that our D matches up well with their offense. Low-scoring, ugly win. Wake Forest. Win. I know the games have been even the past few years, but I think this year BC's talent advantage makes it a fairly comfortable game. Notre Dame. Win. This game will help make or break the season. If Addazio wins, we start 3-0 and have the fan base pumped. If we lose, it will feel like the same old, same old. I think we win but he disappoints later. at Clemson. Loss. Closer than last year but not close enough. Instead of playing to win, we play conservatively and it costs us. Central Michigan. Win. A good overall win as the team plays well in all aspects of the game. Virginia Tech. Loss. This is the rough part of the schedule. I think many fans start to lose hope during this stretch. at Louisville. Loss. I think we will be due for a blowout at some point. I predict it will be Louisville who kills us. at Virginia. Win. It stops the bleeding and feels like a decent road win. Florida State. Loss. I think this will be a real heartbreaker. We lead throughout but blow it late. NC State. Win. I am on record as thinking NC State is ridiculously overrated. I think we handle them. UConn (at Fenway). Win. I think this is one of those games where we make their Offense look incapable of scoring. at Syracuse. Loss. I think Addazio will trip up against one of our peer programs. I think it will be Syracuse just to make the season that much more frustrating. This leaves BC 7-5 (3-5 in the ACC). BC goes to the St. Petersburg Bowl and plays USF. Although it is a quasi-home game for them, we dominate and finish 8-5. It is not another 7-6 season, but it will sure feel like it. If Addazio has any real substance as a head coach, one year he will have a season when it all comes together and all breaks his way. If he ever has a season like that, this is how it might play out. at Nothern Illinois. Win. The D looks tremendous and creates all sorts of turnovers. BC's QB situation still seems a bit unsettled, but the OLine creates big holes for the running backs. Wake Forest. Win. This is a good matchup for BC. BC gets to the QB all day. The passing game looks okay, but BC's deep and talented RBs remain the stars. Notre Dame. Win. Needless to say, this is a big game and a big win for Addazio. The 3-0 start earns BC some votes in the polls. at Clemson. Loss. Both teams are undefeated and it gets a primetime slot on ESPN. The game is low scoring, but BC cannot move the ball against an elite D.
Central Michigan. Win. Another relatively easy game. BC's OL and DL control the game. Virginia Tech. Win. A huge confidence builder. This proves the hot start was legit. With the win, BC is ranked. at Louisville. Loss. The Cardinals tear up BC's top D. This is the worst we look all year. at Virginia. Win. I just don't expect much from UVA this year. I think BC controls throughout. Florida State. Loss. A real letdown in front of a solid Friday night crowd. NC State. Win. As I have mentioned, I don't get the NC State hype. I think we win this game with ease. UConn (at Fenway). Win. We just run on UConn all day. This is fun to watch. at Syracuse. Win. This is very close, but BC holds on in the end. This would leave BC 9-3 (5-3 in the ACC). Clearly not among the elite of the ACC, but it would show that Addazio can compete when he has his players. Because we still don't sell tickets, I think we end up in the Sun Bowl against Oregon. BC wins that to finish 10-3 and just outside the top 10. Here we go! Time for my annual tradition of forecasting BC's ceiling, basement and what will probably happen. As always, I start with the worst case scenario. This season is Addazio's 5th year. It is the one he has been pointing to since the day he arrived. If everything falls apart now -- at a time when it is should be turning the corner -- then the guy is done at BC. I don't think the following will happen, but this is how it could go bad. at Northern Illinois. Loss. Both QBs play and both look bad. The Offense is stagnant and the D allows a few big plays. Wake Forest. Loss. Another low scoring Defensive game. But BC's D is not what it was a few years ago. An 0-2 start basically ends Addazio's career with the BC fanbase. Lame ducks status depends on his new boss. Notre Dame. Loss. BC comes out fired up and the fans show some signs of life. But it is not enough as the OL is a problem. at Clemson. Loss. Another loss, but like ND, it is a close game so apologists have plenty of rah rah nonsense to spin the record. Central Michigan. Win. The first W provides a little relief. The D plays well and BC gets a few big plays from the Offense. Virginia Tech. Loss. BC drops another close game. The team looks more cohesive since the opener, but their record now stands at a putrid 1-5.
at Louisville. Loss. We slow the Cardinals down, but can't pull out the upset. at Virginia. Win. I don't think we are going 0-fer in the ACC again. This is solid road win. There is talk of another late season rally. Florida State. Loss. This is a bad game. FSU blows us out at home. NC State. Win. There is a lot of preseason hype around NC State, but I just have a feeling they will be a little overrated and we will play spoiler here. UConn (at Fenway). Win. I think UConn will be terrible this year and we smash them at Fenway. at Syracuse. Win. Everything looks good. BC controls the tempo and scoring and seems to have the Orange's offense figured out. With this BC would finish 5-7 (3-5 in the ACC). This would be a huge problem for Jarmond. Does the strong finish and strong recruiting class earn Addazio enough goodwill to comeback one more year? I would be against it, but could see how the new AD would want to give him a chance. On Friday, BC announced that the team elected Kam Moore and Jon Baker as Captains for the upcoming season. I always like when the team elects the Captain, as it shows who they view as leaders and who they expect to have a big season. Both Baker and Moore are critical to the upcoming year, so I hope this is a good sign. Congratulations to both on the honor and I hope they both serve BC well. Can Addazio handle the distractions and pressure of Hot Seat talk? None of us know what Martin Jarmond's expectations are for this season nor his vision for who should be leading the Boston College Football program. But that isn't stopping the coaching agents and media from floating names and predicting which jobs will open. I don't know McGuire, so I don't know if he has talked to Moorehead or is just spit balling. As far as Addazio is concerned, it doesn't matter. This kind of talk will go on until he has a breakthrough season. My fear as a BC fan is that the coach will let this sort of talk distract from the mission at hand, which is winning games. Coaches tend to be a sensitive lot. I find Addazio especially so. If you watch his Coach's Show or press conferences, or even his locker room speeches, it is clear he reads and hears the criticism. That's not good. If you are expect your players and staff to focus and block out the noise, you should hold yourself to the same standard. There is so much going on during the course of a season, that losing focus or worrying about job security is not worth his time. Losing focus leads to losing games and it all becomes a self-fulfilling prophecy. Last year, Addazio rallied the team late in the season. It helped secure his job and breathed new life into his recruiting. While I always welcome a strong finish, another rocky start and more blowouts will be a bad standard to establish. But if he wants to persevere, I suggest he doesn't spend any time reading or listening to what we all are saying. Just focus on the team and the games. Two weeks ago the University of Georgia sent me an emailing inviting me to buy season tickets for this year. If UGA is sending me ticketing emails, you know the marketplace for tickets is changing. For some background, Georgia sent me the email because I am technically an alum. I have never bought tickets for any UGA event through the school and have never donated. I should be low, low, low on any priority list. But the SEC Power with a huge fanbase is chasing ticket buyers because the demand for the ingame experience is changing. The secondary ticket market is now trusted, easy to use and so efficient that you can go to most of the games you want to attend and skip the uninteresting games, all at close to the face value of the tickets. It wasn't always this way at Georgia. When I was a grad student in the mid-00s, there was a waiting list for regular season ticket packages and grad students could enter a lottery for the chance to purchase student season tickets. The odds weren't good and the demand was high. If UGA is wasting their time with me, I can only imagine things are even tougher at BC. Our fanbase is smaller and our local sports and entertainment market is more competitive. There is something great about attending a game in person. You see things you can't see on TV and their is the unique energy of a crowd. If I lived in New England I would probably have season tickets. But I understand why more don't. There is really little need to commit like that. It will be interesting to see how attendance is for BC this year. Winning will help. So will the new booze policy. But there will be challenges. Hopefully Jarmond will be more aggressive and creative than the folks at Georgia. It is almost time. This is the last week of summer camp. Next week is game week. Now is the time to pick a QB. Yet Addazio seems in no hurry. Wade still remains the favorite for the job. The fact that he hasn't made the competition a slam dunk case is really a half-full/half-empty proposition. It is great that Brown has shown enough promise to make it a tough decision. it is disconcerting that Wade isn't a clear cut choice. Addazio will decide soon, so you might ask: "what's the rush?" I think this is Addazio's chance to get the team ready and behind one guy. A few extra days will change the mentality around the team. Plus, there is very little downside to naming a guy now. Whoever gets the No. 2 slot will need to understand that he is only one snap away. The backup needs to buy in. If anything, waiting might just anger the No. 2. Whoever wins is going to be on a short leash. Addazio needs to win and can't let one guy fall apart when a similar option is on the bench. This season could be a bumpy ride. Let's start to get through those bumps now when there is still time to fix things. One thing that has been brewing this summer is the success of former BC soccer player Max Schulze-Geisthovel. The German has finished his collegiate soccer career and decided to try football. And at this point, it looks like he's been so good that he will handle kickoffs. Schulze-Geisthovel is not accurate enough to handle field goals, but Addazio won't rule it out. Addazio claims the kid has the biggest leg of any kicker since Addazio has been at BC. I don't really care who kicks. I just want success. Addazio has struggled finding someone he can trust and considering how few points we score, every attempt counts. Field position counts too, so that is where Schulze-Geisthovel can make an immediate impact. The Herald's article on Chris Lindstrom got me thinking about the Offensive Line. Even with all the talent upgrade and the new tempo offense, ultimately the success of this team is very dependent on the offensive line. It needs to be better than last year and needs to be elite if BC is going to be anything more than a seven win team. As the Herald reported, Lindstrom has moved and is penciled in at RT. We know Baker is still at Center. Transfer Marcell Lazard, played Tackle at West Virginia, but is seems with Lindstrom at RT and presumably Montiero at LT, he would be inside. The other guard might be Schmall. On paper, that is a lot of questions marks. There is also plenty of talent and potential. That is where coaching comes into play. One of the reasons we had great success at OLine, is we had great OL coaches. They knew what they wanted and could mold players accordingly. Things started to fall apart under Spaz when he had poor OLine coaches. Based on his first two years, I thought Addazio and his OL coach Justin Frye were perfect. They had the guys ready. Then it all fell apart. Last year was a little better, but still not elite. Now with more depth and experience on the line, this should be a great season. The coaches and the players should be on the same page. A great OL can hide a lot of mistakes. BC needs a great OL to be great. My expectations are improvement. I will hope that they make a big lead and become the ACC's best again. That is when you will know BC has turned the corner. Every few years, NCAA basketball programs are allowed to take a summer trip. This year, Christian took the guys to the Bahamas. The caliber of basketball might not be as high as some of the European or Asian trips, BC and other schools have taken, but it is probably less expensive. A cheap confidence boost is just what this team needs. On Saturday, they won their first game in the Bahamas. It was against the CTG Knights (whom I had never heard of prior to this game). The Knights made it interesting mid-way through the second half, but BC pulled away. The scoring went as expected with Robinson, Bowman, and Chapman leading the way. Newbie Stefon Mitchell chipped in too. BC plays their next game Monday night. I hope they keep it rolling. The rumors are true. BC announced Friday that they will expand beer and wine sales at Alunmi Stadium on game days. The alcohol will be available at select concession stands around the stadium. Jarmond was quick to thank the City of Boston. That's a smart move. Keep the regulators happy. The press release also noted that a third of colleges are now selling beer and wine at their stadiums. As I said when the news started leaking out, this is a good move for BC. It should bring in a few extra bucks and get a few more people to their seat. But this is not a cure all. Let's hope there are more positive moves made in the near future. The Red Sox are requesting the city of Boston change the street outside Fenway from "Yawkey Way" due to the owner's racist past. I don't care how you feel about the move. I don't care about Tom Yawkey or current owner Sox owner John Henry. You can question the timing of Henry's request, but who cares if it is sincere, grandstanding or just out of fear. My concern in all of this is BC. We have a prominent Football building carrying the Yawkey name, and it is inevitably listed in articles mentioning the Sox's move. Before the spotlight comes, before any real controversy starts, BC just needs to get in front of it all and change the name. Right now. Have the change go up before the season even starts. Tom Yawkey had no affiliation to BC. The only reason the building carries his last name is because the trustee of the Yawkey Foundation and former Red Sox President John Harrington had deep ties to the school. Before joining the Sox he taught accounting at BC. It was Harrington who pushed for the gift and Harrington who guided the naming. At the time, the Yawkey name carried much less controversy so it was a no brainer for BC to use it. If anything, there was the belief that associating with the Red Sox would help the program. There is no sense carrying the name if it is going to hurt the program in the slightest. With respect to Harrington, there are a few workarounds that might help in the renaming. BC could call it the Jean Yawkey Center. Tom's widow was a very prominent philanthropist around Boston, and owned the Red Sox and contributed to Major League Baseball without controversy for decades after his death. Adding "Jean" distances it from Tom. I imagine several of the other local non-profits carrying Yawkey names or buildings will do the same. BC could also rename it after Harrington. He was the guiding force for the gift. He was the BC guy. It wasn't his money, but why not give him some credit? I can't think of anything controversial about Harrington that would upset anyone. BC could always rename it after another donor. Take the Yawkey name off now and shop around the naming opportunity to our biggest boosters. That might seem a little greedy and opportunistic, but we wouldn't be the first large non-profit to replace a name based on a bigger gift. While I understand the sensitivity to the Yawkey Foundation, there are BC alums all over their board. I am sure they will understand BC's predicament. There are many courses of action. BC can be thoughtful in their plan and response. However, they can't drag their feet on Step 1. Drop the name now and figure the rest out later. Let me restate, I don't care about this becoming a debate. I don't care how people feel about sensitivity or the president or social justice. There are many areas where I do care about BC's stand on things, but there is no reason to ever get into the fray or become a flashpoint over someone who was dead 30 years before some of his foundation's money headed over to BC. BC announced the members of their first Fan Council. The release didn't bother explaining who the members are or what their affiliation is to BC. I remain cynical as to how much impact the Council will ultimately have, but at this point Jarmond has very little to lose. Future BC DB Tyler Days is excited about his final high school season. This roundup of Dallas-area stars mentions BC OL prospect Thomas Shelmire. Here is the Matt Ryan interview and most of the middle portion is BC talk. The Addazio stuff is a little cliche, but you still here plenty from Addazio and the 9/11 aspect of the USC win. According to Jon Rothstein and a few others, Illinois State grad transfer is committed to BC again. This after spending all summer talking to and about everyone but BC, where he initially committed. As a reminder, Hawkins is eligible immediately and will be an impact player. I don't know what to make of this game of Musical Chairs. His initial verbal was a coup for JC. Then the basketball world reacted with a basic question of "what are you doing getting on that sinking ship, kid?" He flipped flopped and looked elsewhere. Despite talking to solid programs, it seemed like BC remained his best option. Christian and staff deserve some credit for pulling Hawkins back in, but also some blame for letting it fall apart. Hawkins might lift the ACC win total. We can only hope he makes more news on the court than he did off the court this summer. Here is a small highlight clip of new Basketball commit Wynston Tabbs. The Panthers signed Connor Wujciak. Spaz's son -- who had been a walk-on at UVA -- is now a scholarship player as a senior. UVA announced it as part of their preseason. Joe Spaziani is a QB and long-snapper. The other thing of note is the kid's facial hair. I guess when your dad is known for his mustache, you've got to take your facial hair game up a level. BC held another scrimmage Saturday and although everyone talked to the media after, no one really said anything. According to reports and their interviews, both QBs played well. Addazio rotated them with the first team and also made sure the backups got reps. He explained after the scrimmage that he still views this portion of August as the heart of camp and won't narrow down the QB race for at least another week. He doesn't seem worried about the QBs or the passing game. In my opinion the bigger news is that he's still concerned about depth on the OLine and at LB. Both have been depleted by injuries. Young guys will have to play. Let's just hope they are ready. Maryland wing Wynston Tabbs committed to BC! That was sort of a pleasant surprise. Tabbs is highly rated and with decent offers. He also committed early in the process. That is all great news, especially given Christian's precarious position. I don't know enough about Christian to know if he is going to fight to keep his job or mail it in. Bringing in a good recruiting class would be a sign he cares. Maybe Tabbs is the start of something. Maybe Tabbs can even help get other recruits on board. Even if Christian doesn't turn things around, I hope we can sell Tabbs on the BC experience so he remains committed to the school regardless of the coach. In Week 2, we open at home against Wake Forest. The past three meeting between the teams have been close. There is no reason to think this year will be any different. Because it is early in the season and a home game, this will be critical game for momentum. Here are some things to know about Wake now. They have a new Defensive Coordinator and lost a lot of talent. In theory the unit should take a step back. The bad news is their run defense should still be decent. The game will be won in the trenches, where Wake does have some returning talent. Wake has big questions at QB and OLine. John Wolford and Kendall Hinton are both back at QB. They each have had moments, but also have taken a pounding. Are either special enough to make a leap this year? Probably not. BC can bring the pressure early and hopefully disrupt everything. If Wake improves their OL, they do have some talent in the backfield. But other than that, there is not much BC should fear. While the preseason odds favor BC in the matchup, most experts picked Wake to finish ahead of BC in the division. I don't get it. BC was better last year, the game is at home and BC has more overall talent. While Wake has more experience at QB, neither guy is a standout. The only fear I have is BC getting upset in the opener and comes into this game very dejected. But now -- a month away -- I don't really fear Wake. I like BC hype videos, but does anyone else? BC posted another Youtube video from camp. This one is a slickly edited, behind the scenes production that is meant to get fans hyped up. It worked for me. But based on the stats, I am not sure how many people are seeing it. As of late night Wednesday, the video had just over 100 views after half a day. That number will probably double when I post this and tweet it. The video is not a problem. It is well done. The distribution of it is a slight problem, but I assume Jarmond and staff will get some help improving the reach of content like this. The real problem is the lack of fans looking for content like this. In the past ten years, I think many BC fans have fallen from casual to former. That is going to be Jarmond's biggest task. Can he get those people back if Addazio doesn't win big? Addazio is associated with a lackluster era of BC Football and Athletic Department ineptitude. Another seven win season won't change that perception. But for now, I suggest enjoying the video and let the Athletic Department figure out why no one is watching. The Orlando Magic hired BC Basketball Assistant Stan Heath as the coach of their G League team. Losing an assistant over the summer is not ideal, but I don't think anyone is upset by this. How can you get upset? Heath has done nothing to keep this team out of the dumps the past two years and has been a non-factor in recruiting. I want some optimism, but this upcoming basketball season feels like a waste of time. Christian is a lame duck and while the talent might be better, I don't have much faith in that the coaching staff will get them to play well. Maybe with an empty suit like Heath gone, Christian might find a some young hungry assistant who can provide a spark. As I keep hearing good things from practice, my optimism for the season grows. Yet the National experts -- who don't see the world through maroon & gold glasses -- keep pouring cold water on my hope. USA Today released their predictions for FBS teams and have BC going 5-7 (2-6 in the ACC). Considering the 2-6 ACC record follows the same path as last year, their 5-7 conclusion is not a stretch. If the D regresses and the Offense doesn't improve, it could get worse. But I just don't think it will. I will have my official predictions closer to the season, but all the talk of young talent has me looking forward to the year. Addazio's raves about Zach Allen gained some notice in his hometown. EJ Perry is hoping to earn the No. 3 spot on the depth chart. North Carolina shooting guard/wing Trey Wertz will visit BC this weekend. Who is ready to jump on the Travis Levy bandwagon? Since we have to make the most out of the breadcrumbs that come from summer practices, I tend to put a lot of weight on reports and casual comments. If we are to go with Addazio's unrehearsed comments and Saturday's practice, Travis Levy is going to be a big surprise this year. Levy is the freshman running back out of Maryland. He earned a decent rating from the recruiting sites, but didn't receive many big Power 5 offers. Levy was under the radar, especially after BC landed super recruit AJ Dillon. BC needs playmakers. BC's backfield is loaded, so Levy might not get a ton of touches early. But if he makes some big plays, it will be hard to keep him off the field. 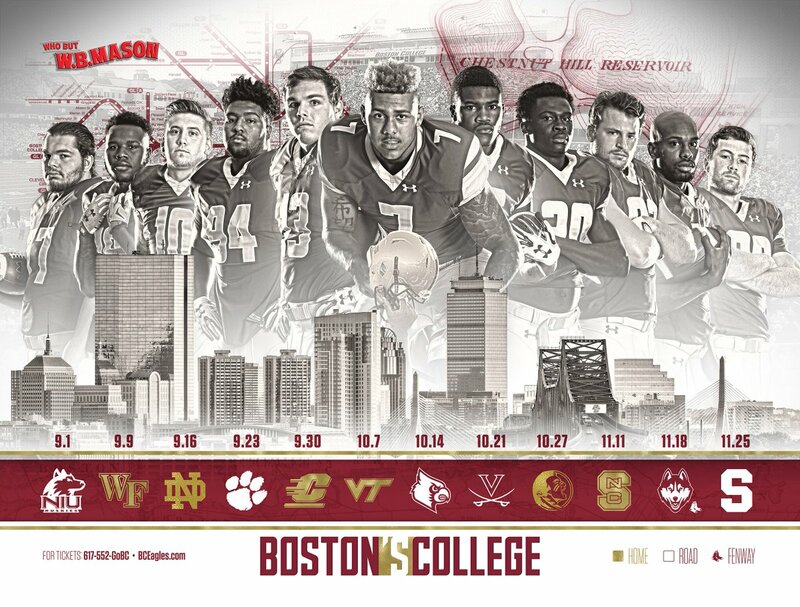 BC released its 2017 promotional poster. It looks cool enough that it should keep the players happy. As much as the Athletic Department would like this to gain traction beyond current BC fans, the poster remains something only the dedicated care about. However, the skyline and "Boston's College" slogan point to the Athletic Department's ambition. They want to be embraced locally. A poster won't do it, but the goal is admirable. Winning games will be the best first step. Addazio and his coordinators met with the media Thursday to discuss the start of practice and the season ahead. While most of it was standard stuff, you can glean a bit of information on the season ahead. I think it is clear that Addazio has confidence in the team and views them as talented. As he rattles off thoughts on each position group, he continues to mention the upgrade in speed and depth. The only area where he doesn't seem 100% confident is Quarterback. He certainly thinks there is talent among the QBs. He also wisely mentions his philosophy of recruiting lots of QBs and hoping one breaks out. But when it comes to one QB to lead this team now, I don't see the same level of confidence. Maybe he will have it by Game 1...or maybe I am reading too much into this all. Here is a good article on the relationship between Landry and Pasqualoni. I do think Coach P was one of Addazio's best hires. He serves as a confidant and can turn raw prospects into elite Power 5 Dlinemen. Tuesday Sullivan reported that Sharrieff Grice retired from Football due to injury. BC did not confirm, but Grice is no longer on the official roster. Sullivan attributed it to linger effects of a concussion suffered during the Spring Game. Although he was expected to contribute, Grice is far from a season changing loss. The Junior might have started this year, but the linebacking group has decent depth. I feel for the kid. Hopefully he has a healthy perspective and will graduate on time. There have been plenty of BC players retire under similar circumstances and the vast majority are success stories. I don't know how the growing concern over head injuries will play out. I just hope all athletes -- BC and others -- make the best decision for their long-term health. For years NCAA rules forbid alcohol sales in on campus stadiums. Plenty of schools -- like BC -- still sold some sort of booze at private events (tents, tailgates, suites, etc. ), but not in the public stadium. A few years ago the rules changed and schools started expanding their alcohol sales. Now it looks like BC will try new alcohol outlets this fall. This is good news for everyone but still not an attendance cure all. It is not surprising that this is one of Jarmond's first initiatives. Ohio State started selling beer last year and it was a huge money maker. I think the same would hold true for BC. Our fans would certainly buy more if it is conveniently sold on game days. I also don't fear this would be an execution problem nor a drinking and driving problem. BC handles unique sales all the time and getting ID is not that big an issue. Potential drivers already have access to booze and Alumni has fortunately avoided any significant alcohol and driving problems. While access and convenience might help a few people get into the Stadium on time and bring a few more fans out, booze won't get Alumni full. When people complain as to why they don't buy tickets or don't go to games, in stadium alcohol is minor issue. The product on the field, the opponent and the overall game day experience are much bigger issues. While people get frustrated with tailgating, it is not primarily an alcohol complaint. It is more about the limited time, pricing, BC's treatment of those who pay extra to tailgate. I applaud Jarmond for trying something new. If it worked at Ohio State, there is no reason it won't work here. But he will still need to make everything about attending a game better, if he wants to see 44,500 people every week.